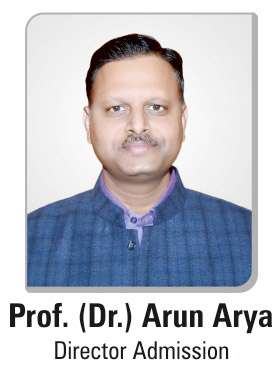 Arya College of Engineering and IT mainly focuses on providing best services to their students. For this, they have inaugurated Arya Avionics Center and Arya Tejas Aero Modelling Club on 2nd April 2018 at Arya 1st Old Campus by the members of Aero Modelers Association of India. It aims at developing and inculcating an interest in building of flying machines like planes and multi-rotors (both autonomous and manual). The Arya Avionics Centre encourages flying among the students of various disciplines especially Mechanical, Automobile and Electronics and Communication Engineering, hobbies, designers, researchers & technocrats by focusing on learning visualizing & innovation in the field of avionics & Aeromodelling. Under this club, students designed various projects like Tow Line Glider, AV-1 Glider, AV-5 Glider, Control Line Model Kit, Flight Simulator and Nitro and Gas power RC plane. Students can assist, explore and learn by working on various projects related with planes and aero modeling technologies. Several electronic components were used in these models that include Battery Pack, Extension Chord, Servo Motors, Honor Switch, Electronic Speed controller, Voltage board, GPS System, Surveillance, transmitter, receiver, Flight Control board, Radar and Satellite Forum. Each model works with different Engine system, speed and Techniques. The club will conduct regular meetings and classes on different aspects related to aviation or Aeromodelling. The major focus will be on making Aeromodelling projects which will promote the students to take part in more inter-college competitions. The lab will consist of certain models designed and created by students for their regular college projects or targeted projects under the proper guidance of their mentors. A live demonstration was given in the inauguration ceremony and the guest has operated each of the models to test the accuracy and perfection in the aero drone models. All of them were controlled by remote. The students were also given hands on practice so that they can have better control on flying. The practical experience encourages them to build more such technology or aero drones helpful for the society. Aeromodelling helps to understand Physics, improve hand and eye coordination, understand the importance of team work, learn to cope with success and failure, create 3D objects, learn to work with plans, use hand tools etc. Aeromodelling is a wonderful form of self expression that gradually leads you to a successful career as a Pilot, Aircraft Designer, Aircraft Maintenance Technician, Aero-Space Engineer etc.